When was the last time you heard a super luxury car maker launching its product in India for commercial sale? 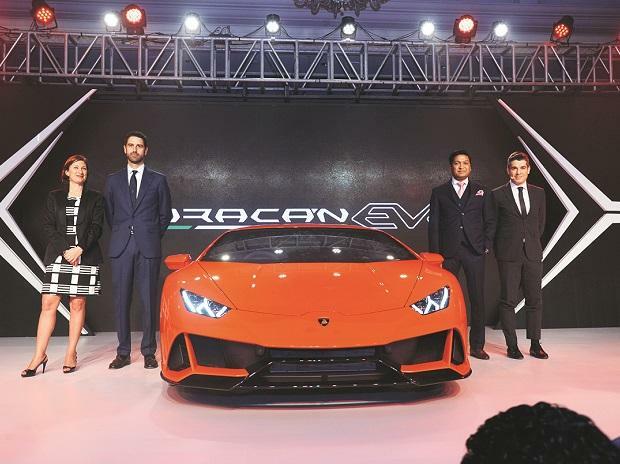 In a first of sorts, Italian super luxury car maker Lamborghini on Thursday launched the Huracan Evo in India — the first market where it is introducing the car after a global presentation in Bahrain. “I think globally we see India as one of an important part of our business strategy and with the Urus we have shown that we understand the market,” said Matteo Ortenzi, CEO of Lamborghini Asia Pacific. The company expects a 60 per cent growth rate this year and in the next five years India will be one of the top 15 markets for the company. The rise in Lamborghini’s India play is because of the success of its SUV Uruv. The vehicle was unveiled in December 2017 and was made available to the customers in the succeeding year. In addition, the Urus is also the first modern Super SUV coming from the house of Lamborghini. The company sold 45 units in India last year, up from 26 units in 2017. Lamborghini India head Sharad Agarwal said when the company launched Urus in the beginning of 2018, it was looking at twofold increase in sales over the 2016 achievement in the next three years. “But we could do double in the year of the launch itself,” Agarwal said. "If we look at our (2018) achievement, keeping 2016 as base, then we should look at achieving threefold in 2019. It means that on the base of 2018, we should be growing at a rate of 55-60 per cent," Agarwal said. Agarwal said the reach of the vehicle, despite having a steep price tag, has been well accepted in Tier 2 and Tier 3 cities. For the Indian market, the approximate price tag of the SUV is set at Rs 3 crore, which also makes it one of the most expensive SUVs in the market. “I think if you see the sports car segment, it has not taken off well due to various constraints like infrastructure. But with Urus we could give a car which was suited for the family,” he said, adding the company has beefed up its after sales service and dealership matching the demand. However, Ortenzi, who oversees the entire Asia pacific market, blamed unstable taxation structure as a major impediment for growth of super luxury vehicles in the country. The entire size of the sports car segment —which includes Aston Martins, Ferraris, Lamborghinis and Porsches — was 100 cars in 2011, and was growing until 2014, when volumes shrunk to 40 cars because of tax structures and economic headwinds. Customs duty went up from around 110 per cent in 2011 to over 173 per cent in 2013. The segment then turned around in 2017, when volumes grew to over 70 units. The current customs duty levied on these cars is 110 per cent and the goods and services tax is 48 per cent. “I understand that being in the super luxury segment, we will be taxed higher than the rest. However, what we and our customers is a stable tax regimen,” said Ortenzi.